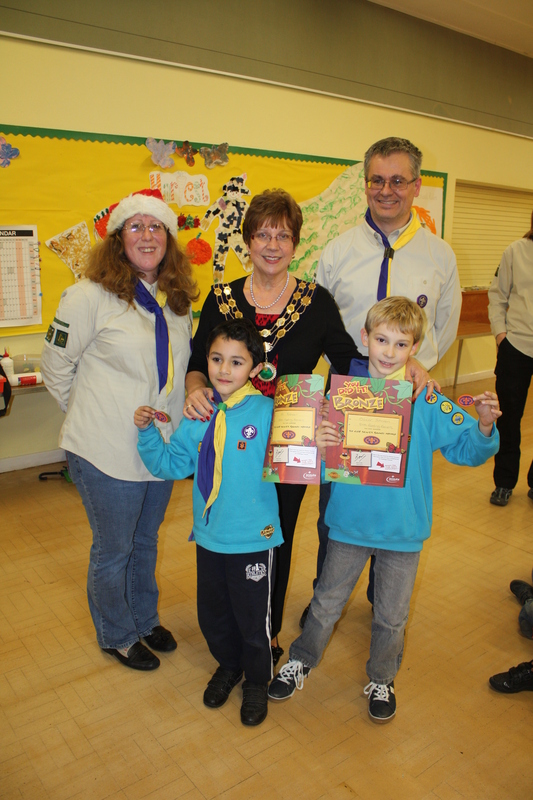 Mayor of Earley Cllr Linda Chambers joined the 84th Reading Beaver Scouts at Radstock Hall in Earley for their last meeting of the year on 13th December 2013 when two busy Beavers were awarded Chief Scout Bronze badges and certificates. Ali Kabeer and Oscar Johnson (both aged 7) have worked hard to meet the demands of six challenge badges since joining Beavers in April 2012 and so achieved the Chief Scout Bronze Award. All the Beaver Scouts enjoyed meeting the Mayor and asked lots of questions about her role. Cllr Chambers managed to satisfy their curiosity and let the Beavers examine her chain of office. She also helped them with Christmas creative activities and watched the Beavers play games.